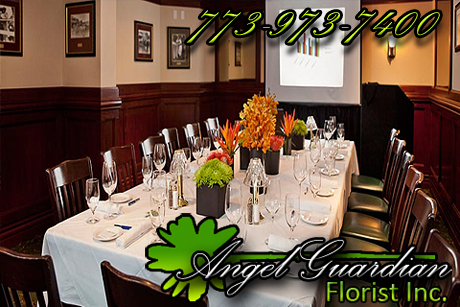 If you've walked through the decorated lobbies of some of the finest hotels and corporate buildings in the Chicagoland area or couldn't take your eyes off of a magnificent floral arrangement at a formal party, there's a very good chance that you've been impressed by the true artistic abilities of the floral design team at Angel Guardian Florist, Inc..
Our highly creative team of Floral Designers completely enhances the immediate environment of any corporate and private event with colorful and aromatic floral arrangements. From simple displays to exotic centerpieces, we guaruntee that our floral arrangements will inspire your clients, employees, and event attendees. Our Client List speaks for itself and includes some of Chicago's leading hotels, restaurants, and retail stores, as well as many astute local small businesses.